Training Tracks’ nationally recognized experts teach fast, fun, effective practical solutions to your real life pet problems. 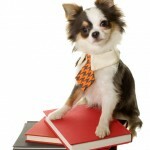 Our owners each have over 20 years of experience working in all aspects of dog training and behavior. We’ve seen – and solved – it all. The owners of Training Tracks are leaders in a national dog training community working to set educational and professional standards for our industry. We publish articles, teach continuing education courses, and hold leadership positions in international professional associations. If you’re visiting our website, the odds are that your veterinarian sent you here. We built our business on partnerships with vets, for whom we provide staff training and other services. We also lecture on dog behavior to local veterinary professional associations. Everything Training Tracks does revolves around training great family pets. We understand families’ real life problems and have practical solutions for all of them, from house-training a puppy to addressing serious aggression. Our certified dog trainers are endorsed by the nation’s most prestigious independent certification bodies. We’re required to meet continuing education requirements and strict codes of professional conduct to maintain them. As the only 2 Certified Dog Behavior Consultants in Cincinnati and Oxford, OH, Training Tracks is uniquely qualified to work with difficult dog behavior cases like dog aggression, canine separation anxiety, and fear. We are so glad we found Training Tracks when we got our Affenpinscher from the shelter. Mel worked to help her overcome her incredible shyness, and each month she comes around a little more. She now even jumps on the couch to cuddle up next to me! Thanks, Mel! You were fantastic. Fantastic! I was referred to Training Tracks by my vet for aggression issues with my puppy. Jeff did in-home training sessions with our entire family to teach us how to minimize this behavior. He is extremely knowledgeable with positive-reinforcement training methods and my puppy responded very well. It was money well spent. I highly recommend Training Tracks!